Care Links Companions is a very unique personal home care agency that caters to the needs of retired professionals and older adults, and those needing help after rehab, or surgery. 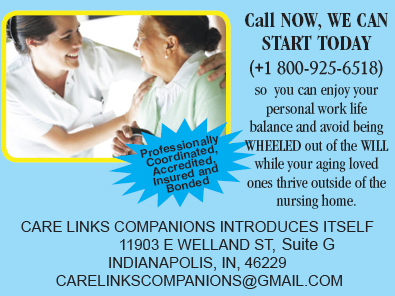 Care Links Companions is a nurse owned and operated company. We take assisted living services into the homes of older adults wherever they may live! We help adults live life their own way-in the comfort of their home, safely, happily doing exactly what they enjoy doing for as long as it is possible. By the time some people find us online, they have already visited quite a few sites, made several calls, have tons of brochures all over the house and still don’t have the kind of help they need. Most people are so frustrated that they call off their search. But you are in the right place now! Care Links Companions is here to help older adults with almost anything! We maintain a high level of personal dignity and respect for the client at all times. Since many seniors desire to live at home for as long as possible we can provide round the clock service when needed. Our caregivers are trained to engage in all kinds of activities that are individually geared to prolong independent living, as well as, assist with the physical, mental, social and emotional well being of our clients. We also provide help in Assisted Living, Independent Living and senior Apts.